Beginning September 1, 2018, ANA will serve new gluten-free rice bread with in-flight allergen-free and gluten-free meals. 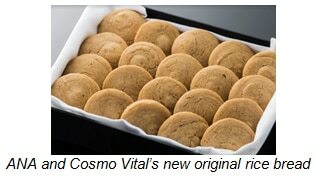 ANA collaborated with Cosmo Vital to create a tasty new option to cater to the growing demand for allergen-free meals. All Nippon Airways (ANA), Japan’s largest and 5-Star airline for six consecutive years, introduced the creation of its new original gluten-free rice bread which will be served with allergen-free and gluten-free in-flight meals. The new bread will be available on international flights beginning September 1, 2018. The demand for special and allergen-free meals has more than tripled since 2015. Although rice bread is already served with ANA’s allergen-free and gluten-free meals, ANA is responding to passenger requests and the growing demand for special meals with the best allergen-free options available. ANA is partnering with Cosmo Vital, a Japanese innovative cooking company, to make a safe and appealing option for passengers with special dietary requirements, allowing them to enjoy their in-flight meals with a higher sense of safety and peace of mind. The incorporation of ANA’s new gluten-free rice bread is an example of ANA’s efforts to go the extra mile to create an enjoyable flight experience. Through attention to detail and challenging the status quo, ANA aims to enhance airline industry features for all passengers. (*1) For Gluten-Free Meal, ANA’s new rice bread is served only on flights departing from Japan.